The turn gave @AMcBrideSJ two pair. It was likely he had the best hand. Here's what happened. The live poker experience is a thrill that, for me, the online game finds difficult to match. Running deep in a large online tournament has always given me an adrenaline rush, but the atmosphere of the poker room and the sounds of the chips shuffling are just so hard to beat. Having been fully focused on my online bankroll over the last eight months, I have found very little time to visit any of my local casinos. Considering I'm only a 30-minute drive from Brighton, and a little under an hour from Central London, I could've added more live events to my schedule. But with the Unibet event in 'Sunny Brighton' just a week away, I thought it would be a good time to get some live practice in. The Rendezvous, owned by Caesars Entertainment, on the picturesque setting of the Marina was my destination. On arrival, I quickly realized how long it had been since my last visit due to the fact they had completely changed their player reward system. This meant re-registering my player card and receiving an upgraded swanky gold colored one. I thought it would be a good time to get some live practice in. For their records, I was asked my occupation and found myself a bit perplexed for a few seconds; I wasn't entirely sure what the correct answer was. I said full-time poker player with slight hesitation, although that is what I find myself as. I don't feel anywhere near the level of my peers who I class as professional players, but it felt good to say. The Rendezvous is one of my favorite places to play, with a dedicated large ground floor for poker. Over the years they have restructured often, and at one time, the tournament room was positioned in a corner section of the considerably smaller top floor. But, thankfully, they reversed that decision. It's a strange feeling going back to a card room or casino after a long period; you never can tell how the level of play has changed but oddly enough you do always seem to see familiar faces. I wasn't expecting a large turnout for the tournament. I decided to play there because I knew they had not met guarantees quite often over the last few weeks. The tournament got underway with 25 entries, meaning a smaller than expected overlay on the £1,200 guarantee. More of a surprise to me was that I recognized about 10 of the people playing from previous visits. It was a £40 no-limit tournament with one re-entry available before the end of level 3. The main structure difference I had to solve was that no antes were in play in the first three levels. Starting with a 16,500 chip stack (15K is the norm, but you get a 1.5K bonus for early registration) I had 330 big blinds to play with. It's a strange feeling going back to a card room or casino after a long period. Of course, playing online, the antes will enter from level one for the most part, and the stack depth wouldn't be as deep. I'm comfortable with that and can adapt my ranges quite easily, so I thought the best plan was to keep it simple, take out some of my bottom range of unsuited cards and have a smaller C-betting frequency in the early stages. It was a friendly and quite chatty table by the tone of the conversations being had. I could tell that the majority weren't going to stick in a 100 big blind stack on a limb and take the luck of the re-entry option, despite suggesting they were there for fun and not the money. The first three pre-ante levels were in all honesty quite uneventful for me. I was hoping to get a few pocket pairs with the aim of set mining. If I hit, I was likely to take down a large pot. I got what I asked for and looked down at 44, 55, 77 and 1010 early on, but unfortunately, I missed the set on each occasion. I was playing solid and taking down smalls pots regularly to increase my stack to 22K going into Level 4 at 200/400/25 ante. Sitting down after the break I noticed the level time had now decreased from 30 minutes to 20. I was confident in my short-stack game and shoving ranges but I was not used to the situation. Over the last few months online, I have significantly decreased my turbo tournament ratio and almost cut them out completely on the advice of a coach. I have learned that the fast structure increases the variance and overall it can negatively affect bankrolls for developing players looking to utilize a solid strategy. The first significant hand I played, I was dealt UTG. At this point, we were ten-handed on a very active table and I fully expected to go four or five ways to the flop. I made the raise to 1K and the player to my immediate left confidently called. To my surprise, the rest of the table folded. I was heads up on an flop and C-Bet 1.2K; getting a very quick call. The turn brought the , another good card for me to bet at. I thought it was hard for him to fold any ace or high pocket pair, so I bet around 2.5K. At this point I expected him to delay and think, but as soon as I made the bet, he made the call. The river came the . I believe my hand is good a lot of the time here. Any spade draw he was clinging to had missed, and of course, I had the blocker. But I made the mistake of checking, hoping he would bet as a bluff. He checked behind to show and I missed out some river value. I believe my hand is good a lot of the time here. Sticking to my game plan, I got a bit card dead. Despite the sharp blind increases, the table was active and getting to late position without at least one raise or a couple of limps was unlikely. Approaching the end of level 6, the blinds were at 400/800 with a 50 or 75 ante. With a 22 big blind stack in the small blind position, I got dealt . 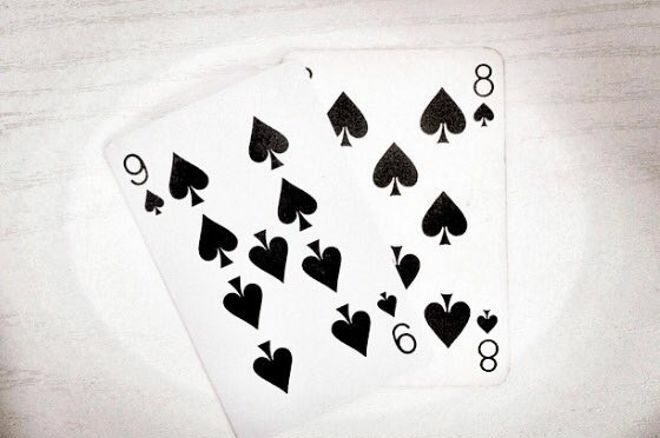 We were now nine-handed and the action folded to the cutoff. He made a standard 2.5x raise to 2K. If I had a slightly bigger stack this would've been a spot to have considered a three-bet. But I felt it was also fine to call knowing that the big blind was an active and looser player; he would likely call and add to the pot. As expected, we went three-handed to the flop. On an flop, both myself and the big blind checked to the original raiser who C-Bet just under a half pot of 2.6K. At this point I had 17K behind me and so did the big blind. I called and the big blind also came along. The turn brought the to give me two pair. It was very likely I had the best hand with only the initial raiser being a small concern in my mind. The action mirrored the flop. Check, Check, C-bet of 4.5K. I decided to shove for 15K, and to my surprise, the big blind snap-called behind me leaving the cutoff to fold fairly quickly. The big blind showed for bottom pair and a flush draw. I was very much ahead and likely to take down a pot worth over 50 big blinds. But the fell on the river to complete his flush and meant I was left with a literally "chip and a chair." I threw in my remaining 500 chip the very next hand and lost. I threw in my remaining 500 chip the very next hand and lost. It was a very unfortunate way to end the evening, but overall I was happy with my game and playing live again felt great. The structure for the Unibet event looks very good! Six levels of pre-ante play on a 40-minute clock, so this week's study will include brushing up on my pre-ante strategy. The event seems to have created a buzz on social media, so I am very much looking forward to playing against some extremely good live players and writing about how I get on! Follow Aaron McBride on Twitter @AMcBrideSJ.